TPMS temperature readings. Of little value in my opinion. 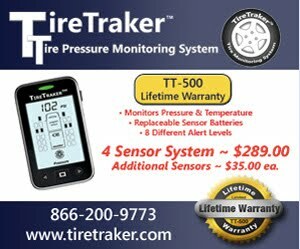 A comment on TPMS: As a tire engineer, I see little reason to present the temperature of the sensor. IMO this extra information has some problems. 1. Tires fail from low inflation primarily due to air leaks (puncture, cut or valve problems) but not from just getting hot. You only get a tire hot from running too fast and/or running to low air pressure. The sensor is not actually reading the temperature of the critical location in the tire as the hottest location is internal to the tire construction and measurement of that location can only be accomplished with a needle probe as done by Race tire Engineers ( I did do that as part of my job once upon a time). 2. The temperature number is distracting and is actually the temperature of the sensor, not the tire and the sensor is cooler than the wheel. 3. The TPMS temperature reading is significantly (25F to maybe 50F ) different i.e. lower than the tire temperature for most applications. More on this temperature difference in a future post. While it is possible for a sensor to report a dragging brake or failing wheel bearing an IR hand gauge is a better tool to use if that is your concern, as the hub will be hotter than the wheel and provide an earlier warning. If towing a trailer you are less likely to lose control of the tow vehicle so you just need to slow down as soon as possible and pull over. BUT the reason for this post is not to address vehicle control but to identify the actions you should take concerning your tires. 1. Before you have a tire failure you should be sure you have the full DOT serial for each tire written down somewhere. 2. With ANY failure, other than puncture or valve failure you should file a complaint with NHTSA. They need the FULL DOT tire serial and full vehicle VIN. 3. Take pictures. In full sun, close enough so only half the tire fills the frame So more than a couple pictures are needed. Snapping a shot in the shade from ten feet away under the RV just isn't useful. Get tread, sidewall failed area, and non-failed area. Make sure the pictures are in FOCUS and at the highest quality possible for your camera. 4. Let NHTSA know you have pictures when you file your complaint. 5. Contact the tire dealer, RV dealer and RV MFG of the failure and the NHTSA complaint number. 6. KEEP THE FAILED TIRE. Tire company may be willing to compensate you but you must have the failed tire. Carry an HD trash bag if you must. A folded trash bag doesn't take space and is only a few ounces weight. No tire = no possible compensation. Note I have posts and video on how trailer owners, Class B and Class C owners can inspect your own tires each year for belt/tread separations. Running a TPMS will give you an advanced warning on Run Low Flex Failure. Having the actual scale load on each tire as covered in the owner's manual will help substantiate your claim. Always run the tire pressure on the tire sidewall for your CIP if you are pulling a trailer. Motorhome owners need scale weight printout and a copy of tire load tables. IMO if you don't do all of the above I am not interested in hearing your complaints. What should Airstream and similar type trailer owners do? One of the Forums I follow is on Airstream trailers. There was a post from an owner who was having problems getting the actual loads on the trailer, hitch, and TV. There were a number of posts on what he needed to do. However, I saw no mention of tire loading or tire inflation so I added the following post to the thread. "When you are done making adjustments and moving stuff around and get new scale readings. You need to look at tire loading and inflation. The best approach is to take the heavier loaded axle and assume a 52/48% split and compare the 52% number with the tire load capacity. You should have at least a 15% load capacity margin. (52% of the heavier axle is no greater than 85% of tire max capacity. Finally, with a multi-axles trailer, you should use the tire sidewall pressure number as your "Cold Tire Inflation" to try and lower the Interply Shear forces that are trying to tear the tire belts off the carcass. You can learn more on my RV tire blog." Note: While I wrote this in response to a specific post/question on an Airstream forum the information on tire load & inflation would apply to similar trailers that do not have slide-outs or heavy residential refrigerators or other obvious unbalanced equipment.